The North Carolina Tar Heels lose their ACC opener in horrific fashion at UVA. The Heels, held to an anemic 52 points, committed 12 turnovers while garnering only 9 assists. UNC's record drops to 10-4 on the year, while their road record drops to 1-3, Long Beach State being their sole road win. It is time to start asking questions about this UNC team. They have so much talent. Way to much talent to have already lost 4 games this season. Losing to Indiana is nothing to worry about. Losing to Texas and UVA is most certainly something to worry about. Clearly the problem is not the talent on the team. UNC is loaded with good players. James Michael McAdoo would have been a first round pick last year had he opted for the NBA. Reggie Bullock is a workhorse both in the paint and from beyond the arc. Not to mention a bevy of young stars in the making that came in a highly touted recruiting class. So what is UNC's problem? The Heels problem is very simply, a lack of leadership. Take the Heels latest loss to the UVA Cavaliers. The Tar Heels clearly had no on court leadership, there was no communication between the players while on defense, and a minute amount while on offense. Even when players had mismatches on offense, which happened often in the game, the players in blue would not call for the ball, and Marcus Paige, freshman point guard for UNC, scored only two points in this matchup, but what hurts even more is the lackluster 2 assist that he had. This is the PG of UNC, only 2 assists? There is no on court leadership of this UNC team, nobody who will take over and help this highly talented team play together. But it does not stop with on court leadership. 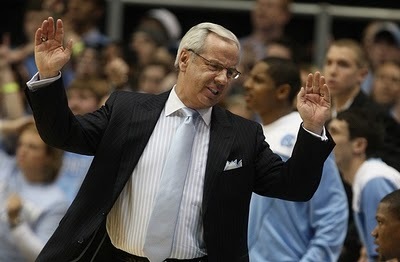 Sadly, Roy Williams is seeing another talented team of his lose control. Roy is struggling, once again, to make his players play like a team. This is the same way the 2009-2010 season started for Roy, he lost a few games that were no big deal, (Syracuse, UK, and Texas) but then things started heading south quickly once ACC play started. That season ended with 17 loses capped by a loss to Dayton in the NIT. This comes down to Roy Williams. His inability to lead players is astounding. The Tar Heel faithful will call me a hater and laugh at this post, but its time to face the facts. The only way that Roy wins is if he has 4 or 5 NBA first rounders in his starting rotation. It is time for change in UNC. I just hope they do it soon, the ACC needs a strong UNC, and Roy is doing more harm than good there.